Saab Magalona lashed out at a netizen who called her out for supposedly being a bad example to other moms. 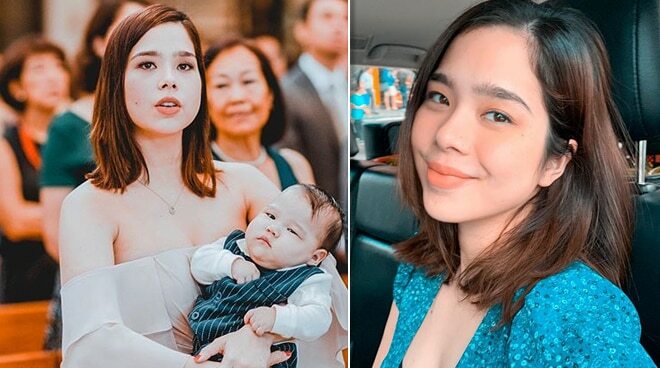 Over the weekend, Saab Magalona earned praises from netizens after sharing a photo of herself fully made up while attending to the needs of her son Pancho during a wedding ceremony. "Shout out to all parents who took their baby to a wedding and prayed sooo hard that they wouldn’t make noise. It was also because of the Lord’s work that I did not fall off my seat while reaching for something in the baby bag," she wrote. While several netizens lauded her for being a hands-on mom, some decided to question Jim Bacarro's role as both a husband and a father. "By the way my husband is an amazing father who lets me sleep through the night by feeding Pancho when he wakes up and he always always offers to carry Pancho and I tell him to back off 95% of the time. So don’t judge him for this one photo," she wrote, defending her husband. Meanwhile, a netizen with the name "pabebe" on Twitter called out Magalona for allegedly being a bad example to other moms simply because she opted to go for formula milk. "Ang cute ng baby kaso naka bottle feed kaya hindi magandang modelo sa mga nanay na may baby #promotebreastfeeding #JustSaying," the netizen wrote. Having none of it, Magalona defended her decision to switch from breast milk to formula milk and asked her followers not to make judgments about her. "Newsflash: you can put breastmilk in a bottle. I still believe breast is best but if you have to feed your baby formula, that’s not a bad thing either! You don’t know the circumstances of each mother and child. Do not judge," the Cheats vocalist wrote. Explaining she did what she had to do for health reasons as per her doctor's advice, she added: "BTW, just so we’re clear, I had to switch Pancho to formula after his first birthday because two of my doctors advised me to for health reasons." Saab Magalona gave birth to twins back in February 2018 but only Pancho survived after being in a critical condition.